Every now and again when I publish a digital copy of a siddur, maḥzor, or other collection of Jewish prayers I’m questioned by folk unfamiliar with US copyright law: how is it that you’re allowed to do this? Are you certain that your work is in the Public Domain? I co-founded the Jewish Free-Culture Society for Open-source Judaism to answer questions like these. 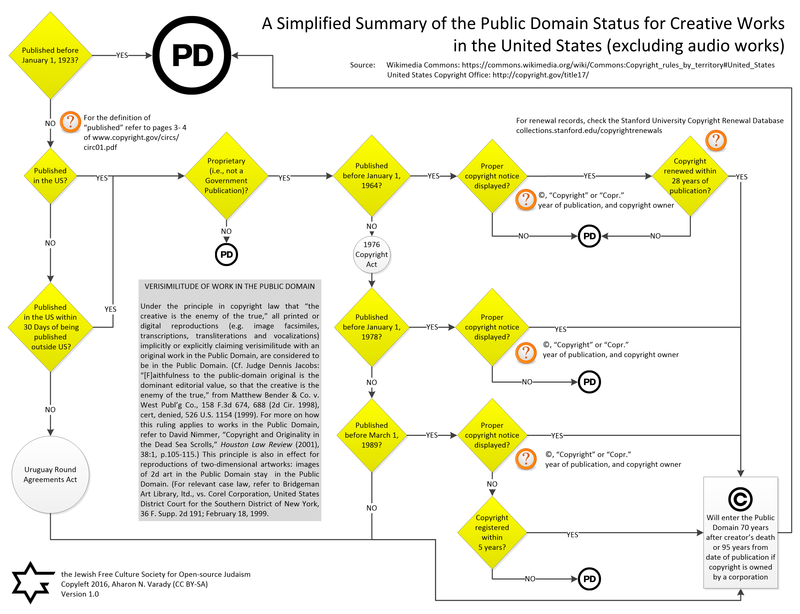 Under this aegis, I’ve created what I hope might be a helpful flowchart (SVG, PNG) for orienting those unfamiliar with how the Public Domain status of creative works can be relatively quickly determined under United States copyright law. Some people are actually opposed to the existence of a Public Domain and would very much like created works to be considered proprietary in perpetuity. Setting aside corporations seeking to maintain proprietary control over their intellectual properties for as long as possible and radical libertarians who oppose on principle the existence of public works and an open commons, there are some who are simply concerned that works in the Public Domain are vulnerable to those with nefarious motives, for example, cultural appropriation. For them, the Public Domain is less an open treasury of historic creativity, the common inheritance of all humanity, and rather: a legal fiction by which the intellectual property of minority cultures are stripped of any proprietary status. They find in copyright a tool to be used against those who would seek to adapt or otherwise modify such cultural works without authority. To be clear, this perspective is not widely espoused — but it can sometimes by heard by those especially concerned with neo-colonialism, cultural appropriation, and the illegitimate use or misuse of others’ cultural heritage. I believe the Public Domain is a blessing, an open treasury for all peoples, and that it is a social convention for limiting runaway property rights. 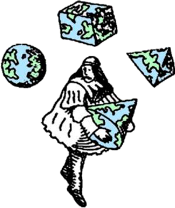 Keeping the Public Domain open to everyone preserves valuable knowledge and creativity for all that some might seek to monopolize for themselves. I believe that to enjoy private intellectual property is to accept — as a participant in society — that ultimately, every idea made public and preserved from ephemeral obscurity and decay must be held in an intellectual commons. Both the Public Domain and the innovation of open-source/Open Content licenses offer the public the four freedoms of cultural works: the freedom to use, study, adapt, and redistribute a work. However, open-source/Open Content licenses are granted with consent by the creator. The Public Domain doesn’t require consent as it is built into the legal concept of property itself. Is this true for all conceptions of intellectual property though? For those cultures claiming ownership of the creative cultural expression of individuals known and unknown, does the Public Domain also exist as a structure limiting private property? For my area of interest: Torah, Jewish thought, and Jewish prayer, I’m relieved to say that it does exist and that it essentially limits any proprietary claims to Torah, Jewish learning, and prayers. However, tension over this point can also be found — from an ancient commemoration of the translation of the Septuagint as a fast day, to restrictions on the writing down of Torah she’b’al peh, to anxiety over the sharing of esoteric teachings. Jews of all stripes (rabbinic Jews, Karaites, Israelite Samaritans, Beta Israel, etc.) have survived as minority groups for centuries working to preserve their cultural treasures, sometimes in the form of irreplaceable manuscripts, only to have them lost or stolen in moments of grave vulnerability. Our communities have been victimized by unscrupulous missionaries who would adapt ritual, ceremonial, and pedagogical resources to further their own religious agenda. There are genuine and worthwhile concerns around making widely available public community resources that were formerly only available through more limited means. We should consider appropriate strategies for preserving our cultural works while at the same time guaranteeing public access. I argue that tools innovated in the world of digital preservation, authority control in the digital humanities, and attribution management in open-source user-contributed code libraries provides the means for negotiating a way forward that provides both access and cultural protection. Using copyright as a blunt tool for protecting cultural works against cultural appropriation is, I believe, misguided. I’ll be speaking more to this subject when I speak at the University of Kentucky this October 26 and 27th at the invitation of the Department of Judaic Studies and the Department of Rhetoric. “A Simplified Summary of Public Domain Status for Creative Works in US Copyright Law (excluding audio works)” is shared by Aharon N. Varady with a Creative Commons Attribution-ShareAlike 4.0 International copyleft license.